* Raising hands. Okay, we all know (kids included) that our students are to raise their hands to talk. But there seems to be some missing information here. First of all, HOW do you raise your hand? Do you wave it all around like you are swatting an onslaught of flies? Um, preferably not. Second, just cuz your hand is up, that don't mean you get to talk, friend. These are things that I took note of this week...and decided to work on improving. * Interrupting. Ugh, a pet peeve. We lose so much time with this one! So I decided to address that in my video as well. * Staying in your seat. I want the kids to talk to me...I want to talk to them! But, as you know, once one kid is up THEY ARE ALL UP and in yo' face. Some of my classes have close to 40 kiddos. We cannot have that many people up and roaming the room. * Silent Signal. There are just some times when I need the kids' ears. And there are other times when I need their hands empty and their undivided attention. I decided to address that as well. After I play this video next week, I will readdress my rules. 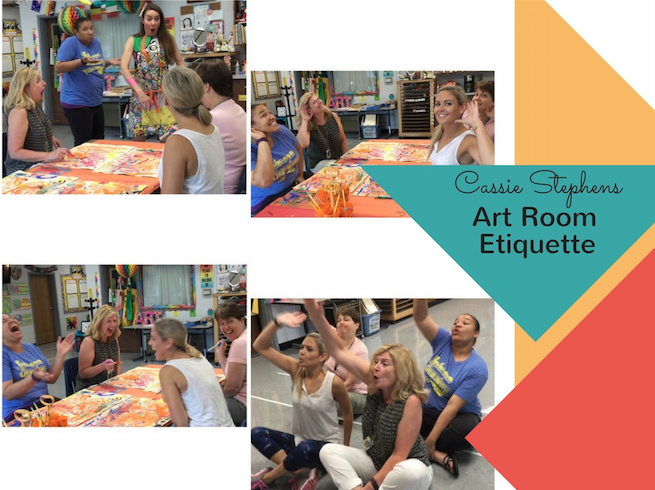 Now, like I shared before, I consider my "rules" to be more life rules...not necessarily what I'd otherwise label routines or procedures (or, in this case, Art Room Etiquette). I'll also share this etiquette video which will be followed up by our chat about consequences. More on that next week! I'll def keep y'all posted...in the meantime, I'd love to hear from you! What do you do at the start of each school year? Are there undesirable behaviors that you are already noticing? I normally just get irritated at these little things...which eventually become big things in my art room. This year, I'm keeping a list of anything I see that I want to encourage and anything I want to change. My goal is to be proactive while having fun. Here's hoping these short videos do the trick! I love how you use humor to make something that could be unpleasant fun and attention getting! Your videos are great and I get a lot of inspiration and entertainment from watching them! 😄 I am interested in making some videos for my own art room use, but not for sure where to start. I was wondering what equipment you use and what programs you use for editing? Thanks for all the inspiration and motivation you bring to all your art teacherin' friends! Was just listening to you via instgram and lost connection, or it shut off. I'm really trying to focus on growth mindset, perseverance and regular peer feedback. Did you say you were going to have a live chat about growth mindset or did I make that up?! Thanks so much, it's great to actually "connect" and learn from a community of teachers. In the Art Room: A Fun Drawing Game! In the Art Room: My First Day with Kindergarten!